A good look at the Stocksy website will tell you that you’re in for a different browsing experience. Stocksy is certainly not the cheapest stock photo service, check Stocksy Review from www.StockPhotoSecrets.com, but they are arguably one of the best and well worth the money. Many stock photo services may get away with paying photographers pennies for their photos, but not Stocksy. Stocksy takes a different approach. Stocksy has a unique photo collection. There is a certain artistic flair that is captured beautifully on the front page. It has a very indie feel to it – a very artisan feel. They can accomplish this because they are a “co-op” company. They stem from the stock photo industry as veterans who wanted to create something different. The freedom to be selective in both their artists and their photos is evident in their collection. The reason they are little more expensive than other stock photo agencies is because they are proud to be able to offer fair pay to the artists and photographers that contribute to their collection. They offer up to 50 percent of the initial royalty fee and up to 75 percent of extended licenses. This is money that goes into both the owners and contributors pockets at the end of the year. The word curated is another word for saying organized. Stocksy United likes to use that word because of the way they organize their photos. They’re not interested in quantity. Instead, they’re interested in quality. That’s a rare trait among stock photo agencies in this modern era where people think more is better. They do organize their images into galleries. These images are often related and called sister “images.” You can browse through the photos and tell that many the photos were taken mere moments apart. Many images feature unique cultures. Stocksy excels in these kinds of images from around the world. We find the word curated again in one of their frequently asked questions. 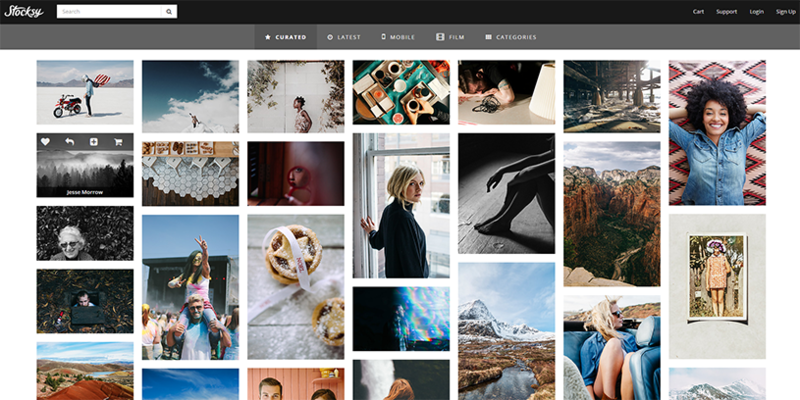 The question states, “Why do Stocksy images look so darn good?” The answer is simple. They are selective in both the photographs and their artists. There is no application that says you’re instantly in the club. Instead, you may apply as a contributor, but there’s no guarantee that you’ll make it past the gate. They have to handpick you and invite you to be a contributing artist to the Stocksy team. That is what they mean by curate. To sustain their image, they must be selective and discriminatory and only allow a certain brand of artist on the worldwide team.